Time slows down inside Okra Cookhouse & Cocktails, a genuine Southern-style eatery that has the vibe of a juke joint somewhere along the Mississippi Delta. 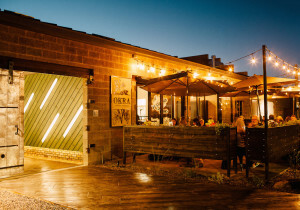 Located inside the Crown in north-central Phoenix, the wooden ceiling trusses and exposed brick walls with okra-red accents offer a comfortable backdrop for a casual, elegant meal. “Okra is a lot of fun,” says Memphis-raised chef Cullen Campbell, who learned the traditions of Southern cooking at his family cotton farm in Arkansas. “I grew up in Memphis, Tennessee, and I wanted some of the things from home—the really unhealthy-for-you cheeseburgers, fried chicken, biscuits, some barbecue and all that sort of stuff.” Campbell opened the restaurant last year with his wife, Maureen, and mixologist Micah Olson. For starters, Okra serves up the best of down-home Southern fare including fried chicken skins and honey hot sauce. The hot and spicy kick comes from Phoenix’s own Homeboy’s Hot Sauce customized for the restaurant. Other menu mainstays include grilled okra and quark, and Campbell’s signature bone marrow biscuits, oxtail and pepper jam. For main plates, rich, flavorful dishes dot the menu. Campbell’s fried chicken—served buttermilk-brined, Tennessee hot or with Umbrian meat sauce—is a comfort food staple at Okra. There’s also catfish al forno, and okra succotash and gremolata. Patrons can also choose from beef brasato, pig cheek pot pie and, buttermilk meatballs and polenta. Every night, Okra features a special, with a fish fry on Friday. For dessert, Campbell serves up one of his most popular dishes, canned biscuit donuts with salted caramel. In the liquids department, mixologist Micah Olson knows how to blend up traditional cocktails to match Campbell’s Southern fare. His Cold Brewed Dude blends Tapatio Reposado tequila, Cartel coffee, pineapple and salted cacao, while his pineapple propeller mixes Plantation 3-Star rum, Monkey Shoulder scotch, Cappelletti, Amaro Montenegro, pineapple and lemon. Other stars on Olson’s list of libations include wines and craft beers plus a wide array of juleps mixed with small-batch bourbons.